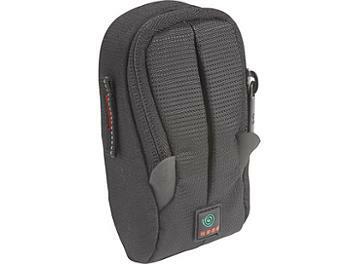 The Kata DP-411 Digital Pouch is made to carry and protect a small digital point and shoot camera with accessories. The pouch features TST RIB structural protection for the camera. A padded divider separates your camera and small accessories, while a designated mesh pocket and included media card holder will keep your accessories close at hand. When carrying, use the secure belt strap connection which enables quick-draw access for all your point and shoot needs, or use the included shoulder strap.